I’m starting to think you need a certain gene in your DNA to make strawberry jam, and that I don’t have that gene. In any case, I desperately want to be in the “I can make jam” club, so I found a cheater’s way to make jam: easy no-cook freezer strawberry jam! Now, if you can make strawberry jam the traditional way, my hat goes off to you. My mother-in-law makes THE BEST homemade jam from fruit she grows in her very own garden. 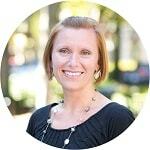 She gives us pints as stocking stuffers and packs some in the kids’ suitcase when they’re done visiting in the summer. I want to be able to do that. I want to give jam to other people. And I want other people to smile and feel special when they open a jar of strawberry jam that I gave them. I’ve been on the recipient end, and now I want to be on the giving end! There’s one catch though. I can’t make strawberry jam. I can’t make any jam really, and it doesn’t matter what recipe I follow. It doesn’t work. For a long time I’ve resigned to just being content with eating other people’s jam and doing other things with the strawberries from the u-pick farm, like dehydrating strawberries for snacks, making strawberry balsamic vinaigrette for summer salads, strawberry chocolate granola for breakfast or homemade ice pops for dessert. Or even strawberry pancakes. Everyone loves strawberry pancakes (and no one likes burned jam). But I really, really, REALLY want to make strawberry jam! I’m hoping I’m not the only one who can’t make jam, so I’m going out on a limb here and sharing my cheaters version of homemade strawberry jam. In short, it’s a strawberry freezer jam recipe. Except it’s BETTER than every other freezer jam recipe because it actually gels like jam should gel! You know how most freezer jam recipes don’t gel? And you’re really spreading a glorified syrup on your sandwich? That’s not the case here. 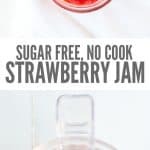 Really, truly, I promise you that you can scoop and spread your no-cook freezer strawberry jam onto any toast, bagel or cracker and it will stay in place WITHOUT pectin or tons of sugar. Let’s discuss a few tidbits about this recipe before we dive in. It’s important that you use good-tasting strawberries you’re making jam. If you wouldn’t eat the strawberry plain (you know the kind I’m talking about), then save them for something else or give them to the kids. Don’t make strawberry jam with bad strawberries. On the other hand, you CAN make strawberry jam with jam berries. “Jam berries” are the not-so-pretty berries that you can find at farmer’s markets. They’re also known as “seconds,” and they’re PERFECT for strawberry jam. If you’re new to shopping farmer’s markets, check out my Ultimate Guide to Shopping the Farmer’s Market. 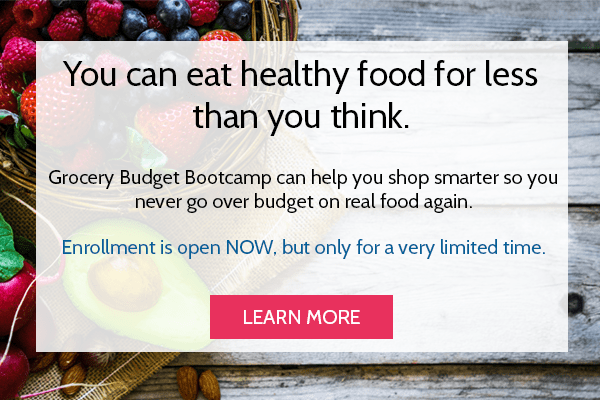 It will help you get the best quality for the best price, year round! Also, my “buy price” for strawberries is $1/lb for conventional or $2/lb for organic. If we’re picking locally, I aim for around $1.50/lb. 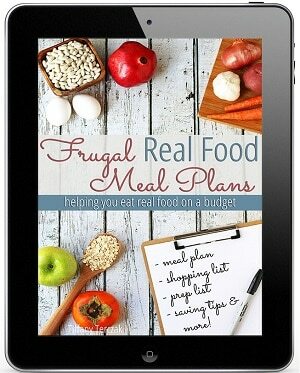 Anytime you can shop around and get the rock bottom price, you are making the most of your budget! 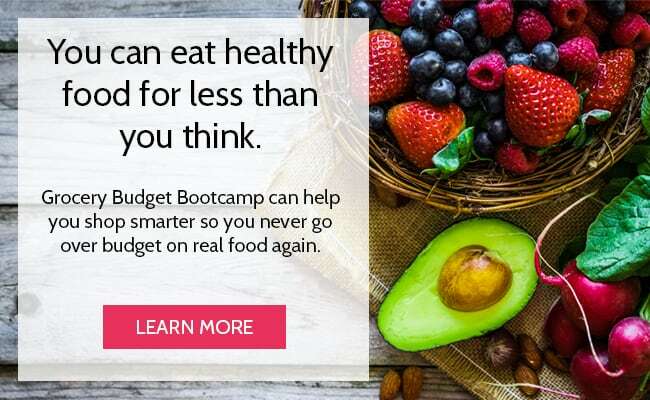 This is one of my core principles in Grocery Budget Bootcamp. 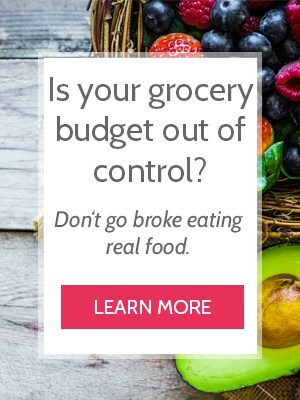 It has helped me keep my family’s grocery budget at $330/month for many years! Don’t let the amount of lemon in this recipe deter you – I promise you won’t notice. Remember how this recipe doesn’t have pectin? Well you do need something to help the strawberry jam actually become jam, and citrus is a good natural source of pectin. Specifically, the zest and the pulp. I HIGHLY recommend using a zester (a.k.a. microplane) and a juicer. I just recently added this zester to my kitchen (despite me saying it was a kitchen appliance you didn’t need), and I’m so glad I did! I’ve been “making do” with the small holes of a cheese grater and a kitchen knife for quite sometime, but having a zester makes ALL.THE.DIFFERENCE. Add it to your Christmas list, borrow one from a neighbor or get free 2-day shipping via Amazon Prime (which you can try for FREE for 30 days!) – trust me when I say a zester makes your strawberry jamming life wonderful. You also want to use a cheap juicer like this one. I got mine at the dollar store ages ago and it’s absolutely perfect for the job. This cheapy doesn’t do any straining, which is good. You actually WANT a little bit of the pulp, because you get an extra bit of natural pectin there. It’s fine if your juicer does strain out the pulp though. Don’t go out to get a cheap juicer just for this recipe. I also used my Blendtec (like this one) in this recipe, but you can use any blender and/or a food processor. I’ve used this small food processor for years and love it. 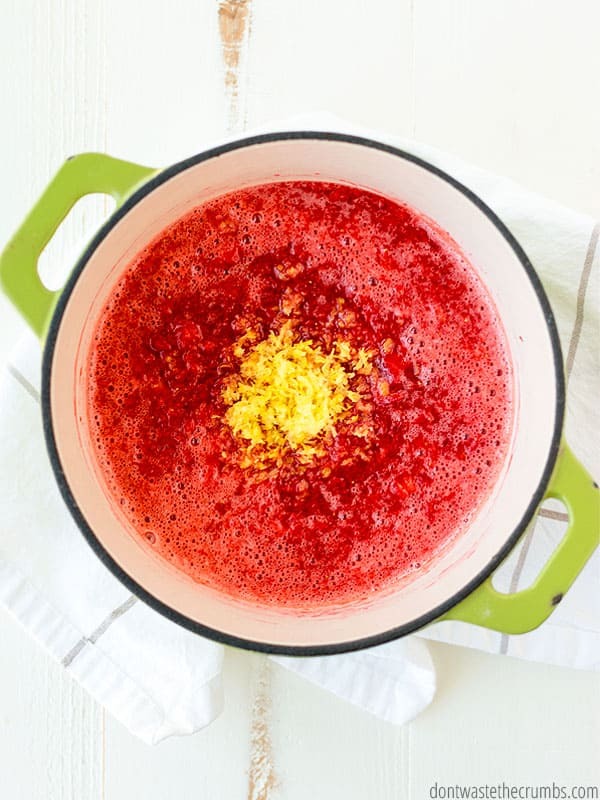 Aside from the lemon zest and pulp, gelatin is the secret ingredient to making your no-cook strawberry freezer jam recipe gel! 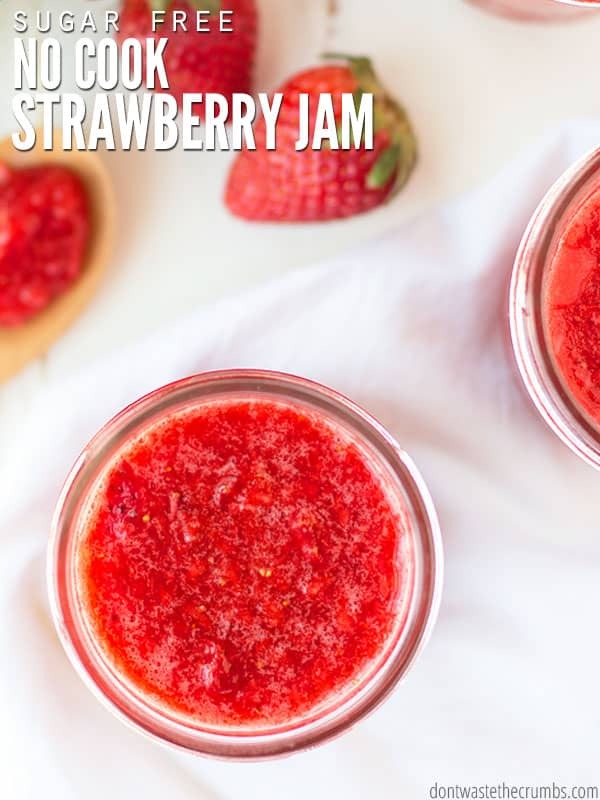 Typically gelatin is associated with making jello, and I have it in my pantry because it’s a treat to make our own homemade gummies, but we’re not making jello in this strawberry jam recipe. We’re using a small amount AND when you combine it with lemon juice and lemon zest, it creates the perfect amount of jam-gel. Gelatin comes from animals, and you should be able to find mainstream gelatin in typical grocery stores. Ideally though, since it is an animal-product, you want to buy the best gelatin you can afford. I’ve tried two different types of grass-fed gelatin before. One tasted like nothing (which is good) and the other had a slight hint of beef. The beef flavor isn’t a big deal if you’re thickening up a gravy or a stew, but I certainly don’t want my strawberry jam tasting like hamburger. Do you? This is the gelatin I use and recommend. It’s not “cheap,” but this one container will make a lot of jam! You end up using about 1 tsp of gelatin per pint of jam, so this container makes 192 pints of jam. It comes out to just 11¢ per pint, and I consider that a good deal for a far better product. 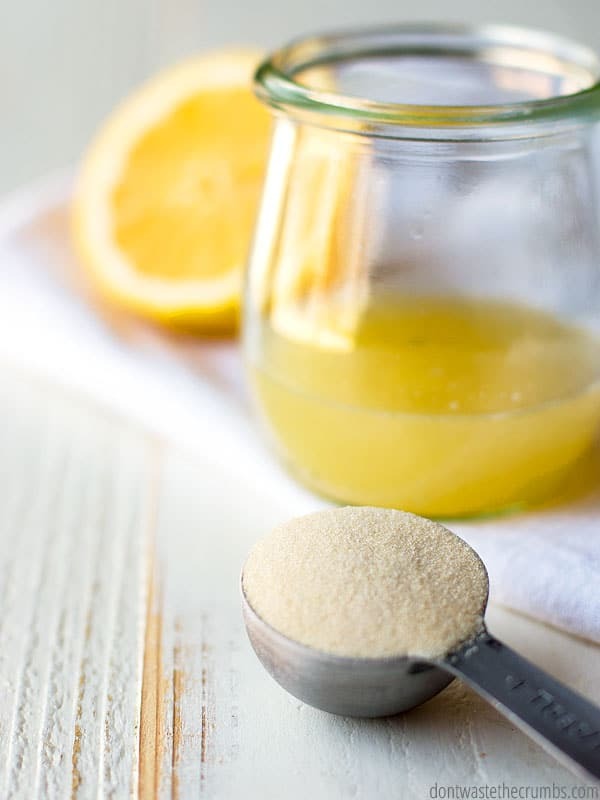 We’re skipping the white sugar in this recipe (one small step towards quitting sugar) and going au natural with one of my favorite sweeteners, honey! Anytime you bake with honey, I recommend NOT using raw honey since the heat will kill all the good and beneficial enzymes that come from raw honey. 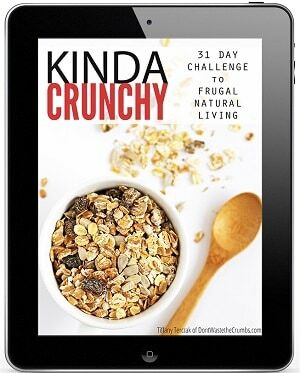 But since this is a no-cook recipe, this is IDEAL for using raw honey! We use raw honey as a way to manage seasonal allergies naturally, so for us, this is a super easy way to continue the low daily dosage. If you are interested in raw honey, I recommend contacting the 4-H club in your county, OR ordering from Tropical Traditions. Their raw honey is from Canada, so it won’t help with seasonal allergies as much, but you’ll still get all the other beneficial enzymes. If the name “easy no-cook freezer strawberry jam” didn’t give it away, this is not a shelf-stable recipe. This is a store-in-your-fridge-or-freezer type of recipe… which comes with a few perks. First, you can re-use old jars. If you were canning this strawberry jam, like you would can homemade applesauce or make homemade canned diced tomatoes, I’d recommend using new lids to ensure your jam actually cans properly. But since you’re NOT canning, you can use any jar you want (as long as it has a lid). Here’s my method for taking old labels off jars with just one ingredient. I still used these cute pint canning jars for one of the batches I made, because I’m giving the kids’ teachers jam as an end-of-the-year gift. My other batches though, I put in re-used coconut oil jars! 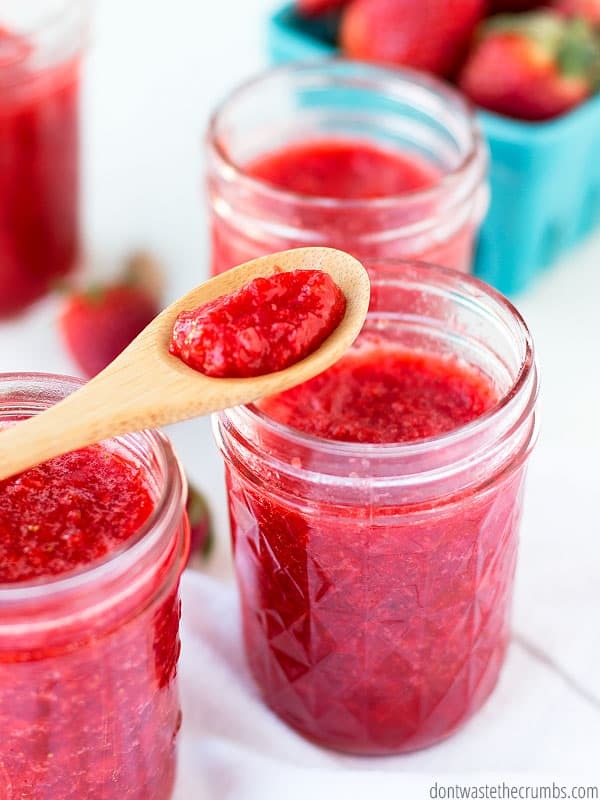 If you’re going to freeze this strawberry jam, this post on how to freeze in glass jars without breaking them is a MUST read. Second, you’re not heating up the house in the summer. ‘Nuf said. Your jam will be good in your fridge for at least a week. I’m sure it’ll last longer thanks to the honey and lemon (both are natural preservatives), but my kids gobble this strawberry jam up pretty fast. In the freezer, your strawberry jam is good for up to a year. To thaw, move one from the freezer to the fridge and let it slowly warm (from freezing to cold) overnight. Alrighty then – IT’S TIME TO JAM! Prep all the strawberries. 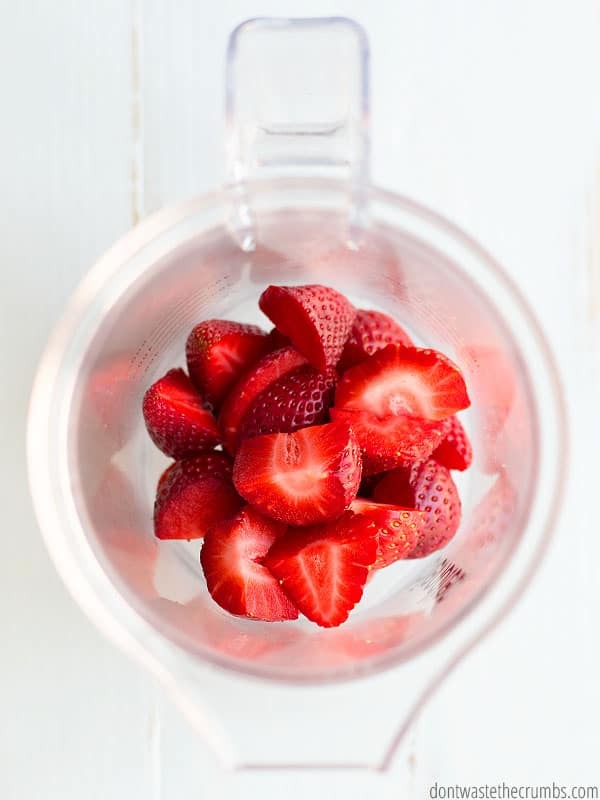 Place 1 cup of strawberries in a blender or food processor and puree until mostly smooth. Pour lemon juice into a medium-size stock pot. Sprinkle gelatin on top of the lemon juice. Set the timer for 2 minutes. Warm the mixture for about 5 minutes, stirring often until the gelatin is completely dissolved. 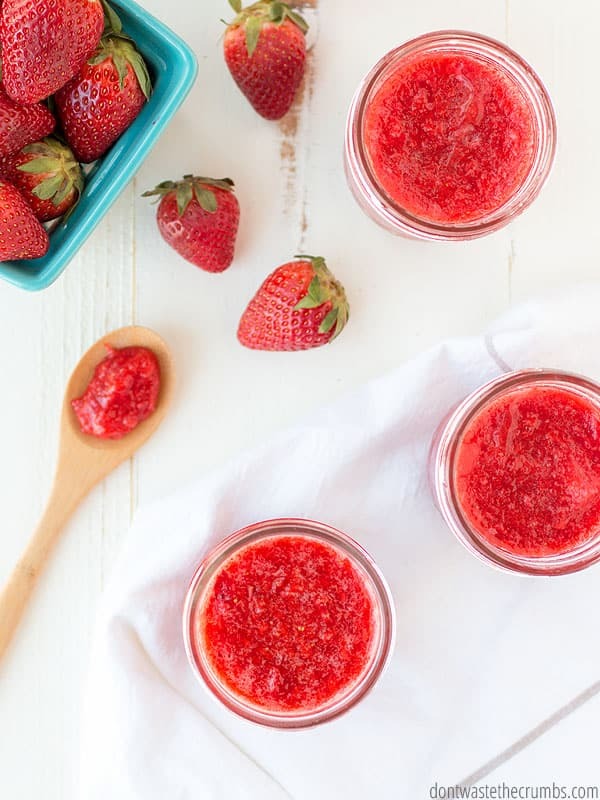 If you want a smooth jam, pulse the remaining strawberries in a food processor or blender until desired texture. If you want a chunky jam, add the remaining strawberries to the pot and mash with a potato masher or the bottom of a glass. Add the lemon zest and honey and stir well to combine. Carefully pour the jam into pint glass jars and place in the fridge overnight. Jam is good for at least a week in the fridge. Store in the freezer for long-term storage. Have you ever made strawberry jam before? What’s your favorite type of jam to make? Thank you for all your homemade recipes. I really appreciate the effort 😀😀. I wanted to ask if there are any plant based sources of gelatin or from fish? You’re very welcome! Here’s a post on vegan alternatives for gelatin. I haven’t experimented with any of them, but you’re welcome to! Hi Tiffany! You may want to check out something I switched to a couple of summers ago! It’s called chilling powder and it’s all plant based gelatin from Mary Jane Farms. Really great sub for animal based. I did bring my strawberries to boiling temperature first since they weren’t the freshest thinking it’ll help a jar last longer in the fridge, and it didn’t affect the consistency at all. Wonderful news Brittany! I’m so glad you like it. It is super easy, isn’t it? I love the idea of adding orange zest too. I bet it has a super “fresh” taste, right? Is the gelatin the same as the boxes of unflavored gelatin in the Jello aisle? Yes it is Victoria, except the quality of grass-fed gelatin is better. Use what you have and what you can afford! Hi Amber! I appreciate your thoughts on this recipe! I’m thinking our palates may be different, or perhaps your berries weren’t very sweet in the first place? I tried this a couple times to ensure the lemon wasn’t overpowering, and I didn’t think it was. In either case, I’m glad the kids enjoyed it! Would the recipe still work if you did the lemon juice but omitted the zest? I love the lemon but for those who don’t really like it. I thought the same thing. It gelled really nicely though. Just wondering if you could use more gelatin and less to no lemon and still get jam results. Really enjoy the taste of this jam. Do you have a similar recipe for raspberries? I loved the ease of your strawberry jam recipe and that I could use honey. My husband is a diabetic and honey is better for him than sugar. Hi Debbie! I completely missed raspberry season here in Georgia, so I haven’t tested that yet. With that said, you could swap raspberries for strawberries in this recipe and come out with something pretty good! Taste before you’re done, since raspberries can vary significantly in sweet/tart flavor. The lemon would stay the same (since it’s for pectin, not flavor). Let me know if you give this a shot! I tried this jam and my kids love it! I love that it has no sugar and no Pectin. It looks and smells great! I like it, but I kinda felt that you could taste the lemon a little too much. Didnt have a very strong strawberry flavor, like the lemon kinda masked that. But still, I definitely want to make it again! Same here. Very lemony! We liked it, but heads up to anyone who might not. Does this thicken as it cools? Wondering if I should add more gelatin? Mines soupy. Katrina, it does thicken as it cools and as it’s in the fridge. I don’t remember mine being soupy, but it wasn’t super thick on the stove. Once it cools and is in the fridge/freezer, it’s perfect spreading consistency. Could I use this recipe with other fruit? Also could I use other sweeteners like Stevia? I see that the recipe calls for gelatin. could I use KNORR Unflavored gelatin? Hi Linda – I’m sure you can use the same premise for other fruits and sweeteners, but I haven’t tested anything other than this particular recipe. For gelatin, the KNORR brand should work – but again – I haven’t tested it myself. I made this jam it’s delicious, a little lemony but my family liked it! I was wondering could I use coconut sugar instead of honey? Have you tried it? I haven’t tried it Stephanie, but I bet it would be good! Awesome! I tried to make this same thing last week, but without your recipe, so I left out the lemon and probably used different proportions of the other ingredients. My daughter doesn’t care for strawberry chia seed jam that I make, so I was hoping gelatin would work. I can’t wait to try your jam! I hope you like it as much as we do Rachel! Do you think this would freeze well? I love making freezer jam and would love to try this, but we just don’t eat it enough and I know we wouldn’t get it eaten before is spoiled if I can’t freeze it. So can you do this with frozen berries? Are does it make it too juicy and soupy? It might work with frozen berries, but you’d want to thaw and drain them. Jam is typically made with fresh so it might take a little experimenting. Wow, I am so impressed by this recipe! My husband and I have eliminated sugar from our diet and have not had a good jam until now. I substituted 1/2 cup of truvia for honey and it turned out perfect! thank you so much Tiffany. You’re very welcome Susan! Thanks for sharing the substitution idea!